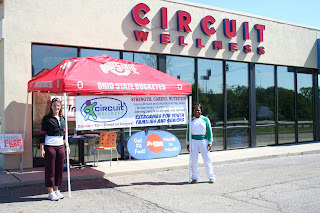 Press Release/ Columbus, OH, October 1st, 2008 – The new neighborhood fitness center, Circuit Wellness, has opened its first Central Ohio location in the Lee Plaza center in Columbus, Near Schrock and Cleveland Ave. Circuit Wellness is working to become the leader in neighborhood fitness centers by offering a unique 30-minute personalized workout using revolutionary Simbio™ equipment in convenient locations along with a supportive staff. Unique to this area, Circuit Wellness also offers “Exergaming” which is exercising using video game technology. “Exergaming is a fairly new concept that I know will really take off as we spread the word and get more people involved. This concept is perfect for the more sedentary youth who prefers to play video games, watch TV or sit at the computer then to play outside. We offer products such as The Lightspace Play Floor, Makoto Sports Arena, Wii, Wii Fit, Dance Dance Revolution, Xavix and Exerbikes – where you have to pedal the bike to make the game work.” said Benson. The Circuit Wellness staff conducts an initial diagnostic fitness evaluation to develop a fitness program that fits the member, including strength and resistance, and aerobic and cardiovascular training during the first month of membership. The staff introduces guests to the newly developed, easy-to-operate Simbio System, by Life Fitness. The equipment provides maximum effectiveness without the soreness typically associated with traditional weight stacks. The staff continues to work with each member to track progress towards personal fitness goals. The initial diagnostic fitness screening is just one part of Circuit Wellness’ one-of-a-kind Guarantee which includes a one-week free trial program for every new member. After 30 days, including three personal training sessions and 12 visits, the Circuit Wellness Membership Promise offers a full refund for unsatisfied guests. The new Westerville Circuit Wellness location is open Monday through Friday from 6:30am to 8:30pm, Saturday from 8:00-2:00 for Circuit Workouts, and Saturday & Sunday, from 2:00 – 6 pm for birthday parties. For a tour of the fitness center, call 614-901-2348. For more information on the company, go to www.circuitwellness.com . Exergame Fitness is the world’s largest distributor & supplier of Exergaming and kids fitness products to YMCA’s, Schools, JCC’s. Park Districts, Health Clubs, Hospitals, Kid Zones, Family Entertainment Centers, Casinos, Government/VA and more. Exergame Fitness provides Facility Planning & Installation, Grant & Funding Assistance, Program Design & Product Training, Turnkey Marketing Support, Free Layout Designs & Concepts, Detailed Programming Curriculums, Finance & Lease Options and more. Exergame Fitness offers the lowest prices on any of the products they carry backed by a 110% Lowest Price Guarantee.